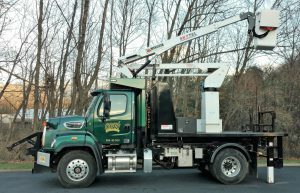 When comparing hydraulic hooklift systems to roll-on cable-hoist loaders for trucks, advocates of each type are eager to point out their respective advantages. Both systems, of course, enable waste haulers, cities, contractors and others to purchase one chassis, equip it with their system of choice, and lift or roll on as many different truck bodies as desired. With this lift-on or roll-on capability, a rig that serves as a dump truck one day can become a flatbed the next day, a tanker the following day, and so on. You’ll add new bodies to your fleet, not entire trucks. But which system to choose? Some will argue for the greater familiarity that many have with cable hoists and the larger selection of pre-owned cable equipment on the market. On the other hand, hooklift users will tell you about the faster loading speeds, more pickups-per-day and enhanced safety afforded by their systems. Hook loaders are acknowledged to be better when maneuvering into and out of tight spaces. They’re also more accurate for unloading containers in exact positions. Why? Cable hoists need more fore-and-aft or horizontal open space than hooklifts to load or drop-off a container. Hook loaders are more forgiving when lining-up loads. With a cable hoist, the stingers of the rail must be in almost perfect alignment with the front wheels of the container. Not so with hooklifts. When picking up, they can engage a container up to 30 degrees off-center. Operators spend less time seeking that perfect line-up. And even younger drivers can get the hang of hooklifts faster. Bottom line? Conduct your own due diligence. Before spending your money, spend some time to research which system will best meet your needs, adhere to your budget … and contribute to your ongoing efficiency and/or profitability. For selection, savings and service, make Ampliroll your first choice in hydraulic hooklift systems. Ampliroll Hooklift Systems are manufactured by Marrel – the inventor of the dual-pivot hook loader in 1969 and first again in bringing them to users across the U.S. in 1980. Today, Ampliroll is the only supplier in the U.S.A. of premier hook loader systems and associated equipment. Unlike many others, we also offer a complete selection of truck-mounted accessories and roll-on/off bodies that we can supply as a package with our hook loaders, allowing for single-source acquisition! Select from aerial lifts, cranes, grapple systems and more. Also choose from cement mixers, dump bodies, flatbeds, septic pumpers, waste containers, water tankers and other interchangeable bodies. In addition, you can select from our line of high-quality pre-owned hooklift vehicles.